Black Pexmor 3 -in-1 is a Foldable Exercise Bike with a compact and portable design for at home cardiovascular workout has recently been released and appeared at Amazon.com and scores 5 out of 5 stars by two customers on the day of this product review. 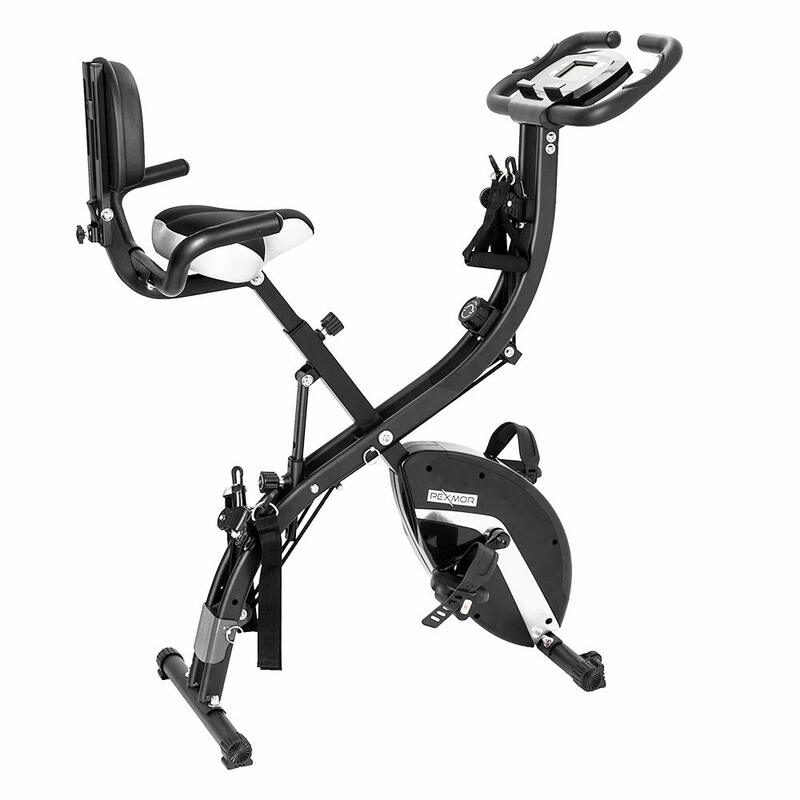 It is an upright, semi-recumbent and recumbent stationary bike with a convenient foldable design, but still a very sturdy construction and 300 lb. user weight capacity. The large, ergonomic and comfortable PU leather padded seat that measures 11 x 3.6 inches can be adjusted to five different heights offering a more customized fit to accommodate shorter and taller users. And the also soft and thick backrest offers great support for your back and is also adjustable for height to make you feel more comfortable, especially during your longer exercise sessions. It has two anti-slip basket pedals with straps to keep your feet in place during your session. You can adjust the tightness of the straps, so there is no slipping. The stationary bike comes with the arm resistance bands to help you work on your upper body while you ride the bike and work on your lower body. You can also stretch your leg muscles with the adjustable leg resistance bands, after your riding session. Pexmor 3-in-1 Bike weighs 41.9 pounds, has a space saving design and is easy to store as folded. It is easy to put together within just ten minutes and with the assembled measurements of 40.6 x 26.7 x 16.2 inches and the folded measurements are 51.2 x 12.6 x 16.2 inches. It has a folding design and transport wheels that make the relocation and storage easier. 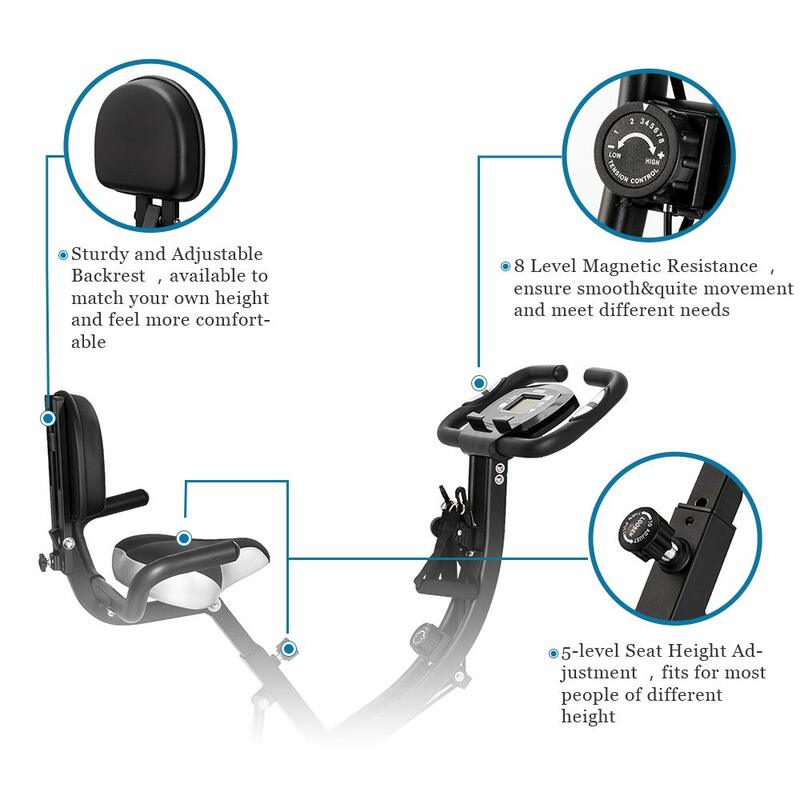 There is an upgraded ergonomic magnetic resistance and a heavy duty flywheel that weighs 5.51 pounds for more challenge with the 8 levels of tension resistance during your workout. You can cycle smoothly and quietly at all levels and consistently. The bike is very easy to maintain and you won’t need to do much to keep it functional. As it runs quietly you can use it while watching TV or listening to music, be distracted and work out longer and not disturb anyone in your house or your neighbors. This great little bike offers you a total body workout that involves different major and minor muscles in not only your lower body, but also the core section and the upper body. You will be able to enhance your upper body strength as well. There won’t be any burden on your joints or muscles as you will not need to do any And you can put it in a convenient corner or in your bedroom closet when you’re done with your daily workout. Pexmor 3-in-1 Bike has a small multi-functional LCD display panel that is easy to read in dim or bright light, with the regular indicators of speed, distance time, calories burnt and heart rate via the handle sensors. You’ll be able to track your accurate workout data and progress on a daily basis. Having a three in one bike with vertical, semi-recumbent and recumbent options as well as the elastic bands for upper body and the leg stretching bands, gives you a good deal of flexibility and saves you on money and space. You can put your smartphone or tablet on the tablet holder on the LCD display. Overall it is a good quality bike that looks nice and does the job well, and offered at a fair price.